Usually, each Friday afternoon, I plug in my phone to charge, power it down, and bring in Shabbos with no worry that it will ring or buzz. Come Saturday night, I turn it on and it buzzes to life, dinging and chirping as messages that came in over Shabbos materialize on the phone. For the longest time, when I wanted to turn it on, I would press the power button in and hold it. Since I have a protective case on the phone, it’s a bit harder to press and I have to hold it until it lights up and starts to work. Then one day I realized something amazing. As I said, I plug in my phone before I power it down. Why? Because if I turn it off first and then plug it in, the phone will turn back on. It struck me – I don’t have to depress the button firmly and hold it down with force to turn it on. All I need to do is unplug it and plug it back in! Instead of exerting myself, I merely reconnect the phone to its power source and it comes to life all on its own. Since I figured this out, that’s how I turn my phone back on. It is easier and more effective. Its parallel to life was not lost on me. Often, we come across people who are turned off to something. It may be Torah, it may be people, or it may be HaShem, Himself. Their screens are dark and they don’t vibrate with life. Too often, when we want to wake these people up, we try to use force to get them to move or change. We press and depress, and are firm, and we don’t understand why it takes so long to get a positive reaction. Perhaps, if we were gentler, and simply helped them connect to the Power Source, they would light up on their own. They say a watched pot never boils. If you are waiting to cook something in boiling water, it can seem like an eternity looking for even the tiniest bubbles to form. But as I learned the hard way, when making pasta, if I cover the pot it will not only bubble but it will bubble over with foam. I didn’t add any more heat to the fire. All I did was help it stay warm and better utilize the heat it already had. Once again it’s not about using force, but about maximizing what the items has inside. Come Pesach, we will read about the four sons. We all have a pretty good idea in our heads of what kind of boys they are and into which category many of the people we know fall. But one thing that many of us don’t know is that we’ve got a big piece of it wrong. We are told, in regards to the wicked son, “Af atah hakhei es shinav,” which I’ve always translated as, “You should knock out his teeth.” He doesn’t want to be good, so we force him to see things our way. Except that isn’t what the word means. If it were spelled with a kof, it would come from the word for hit. But it doesn’t. Hakhei spelled with a kuf means to blunt his teeth, to take the edge off. Instead of knocking out his teeth, we’re supposed to be patient with him, answer his questions, and let him see that they really don’t have teeth; that they’re not real questions at all. 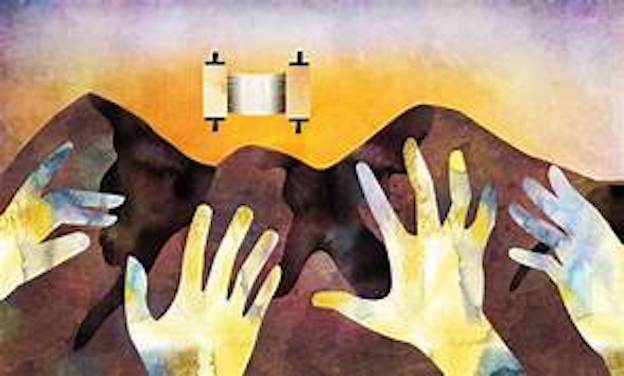 We are to treat him respectfully and help him connect to HaShem so that he is enlightened on his own. R’ Shmuel took the trembling man to his home and made him comfortable. He treated him for several weeks as an honored guest and never mentioned the issue of his being insulted, nor did he take the opportunity to belittle the man for his affront. Some time later, the Caliph called for the man to see that his order had been carried out. The man could not stop lavishing praise on Shmuel HaNagid for his wisdom, kindness and generosity. This is the connection we’re supposed to make on Pesach. According to how each person views the world will be the explanations and answers we give him. We are enjoined to dull the teeth of the wicked son without using sharp words ourselves. Instead of exerting pressure, we just need to make the connection and the world with be a brighter place. Feedback is welcome and appreciated. E-mail info@JewishSpeechWriter.com to share your thoughts. DEDICATION OPPORTUNITIES ARE AVAILABLE FOR MY NEXT BOOK! INSPIRE PEOPLE AND HONOR A LOVED ONE AT THE SAME TIME. E-MAIL FOR DETAILS.